In the breakdown of a marriage, legally speaking, there can be a lot of information to consider. We are on hand to guide you through the process. 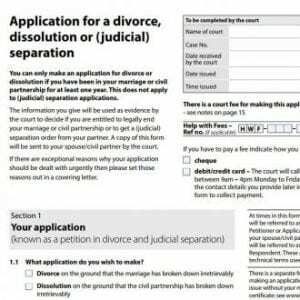 However, if you do decide to start the process yourself, you should know that there has recently been a change to the Divorce Petition. It is still known as the D8 Form, but there has been a slight change to the content. Please make sure that you use the correct form. The Courts are currently suffering a severe backlog, which may result in a delay to your matter if the Petition has to be returned. Do you know the different stages of a divorce? In your initial consultation, we will explain the the process from Divorce Petition to Decree Absolute and the options for Financial Settlement. In the meeting, you will be fully informed of the likely cost in your case and reminded of your cost position throughout. If you have any queries about divorce and family matters, please call our family solicitors on 0191 378 7620 – Marie Riley and Callum Thomson are on hand to help.